By Neely Simpson. Jul 18, 2015. 9:00 AM. "If people only made prudent marriages, what a stop to population there would be!" 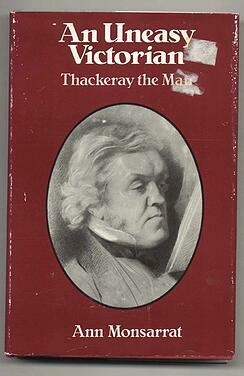 William Makepeace Thackeray, best known for novels like Vanity Fair and Catherine, did not make a prudent marriage. He seriously considered marrying for money, but when he met Isabella Shawe, he married for love. Although theirs can’t be considered a marriage that was full of happiness and good times, it certainly spurred him to prolific writing. For most of his career he had to "write for his life," as he called it, not only to support his family, but also to pay for the treatments and care required for his wife who fell into so deep a depression, she was often catatonic. In 1834, Thackeray traveled to Paris to serve as his grandmother's errand boy. She had suckered him into the position with a small stipend and the promise he would get to be something he longed to become: a Parisian art student. It was there he met Isabella Shawe in a Paris drawing room. After a year in the employ of his grandmother, Thackeray found himself a humble bachelor pad on the rue des Beaux Arts, and managed to cobble together a meager living selling sketches to French publications. He was poor, having lost the majority of a 17,000-pound inheritance in an Indian bank collapse. The rest of the inheritance he had gambled away after a short stint at Cambridge. Still, he was having the time of his life as a Bohemian art student hanging out at the Louvre and in art studios, drinking small beer, and eating in inexpensive cafés. He was a regular at the piano parties of Mrs. Crowe, wife of the Paris correspondent for the Morning Chronicle. It was at one of Mrs. Crowe’s parties that he met Isabella. Financially, Isabella was not much better off than Thackeray. She was the daughter of an Indian army colonel who had died and left his wife with five children. Despite trepidation on the part of both of their families and concentrated effort on the part of Isabella's mother to end the relationship, Thackeray and Isabella were married at the British Embassy in Paris on August 20, 1836. In her biography of Thackeray, An Uneasy Victorian, Ann Monsarrat writes, "In the course of his courtship, Thackeray had given Isabella a ring, a diamond set between two opals, which he had shown in triumph to a friend. 'But, William, see what you have done,' cried the confidant, gazing at the black enamel round the stones, 'this is a mourning ring, not an engagement ring.' It was to prove an ominously appropriate token." The first four years of their marriage were very happy. Their first daughter, Anne Isabella (Annie), was born June 9, 1837, and their second daughter, Jane, was born July 9, 1838. However, things began to go downhill for the Thackerays when Jane became ill and died on March 14, 1839. She was eight months old. After the birth of a third daughter, Harriet Marian (Minnie), on May 27, 1840, Isabella fell into a deep depression from which she never recovered. Thackeray undertook a series of trips he could barely afford in an effort to heal his beloved wife. First, the family traveled to Margate in hopes the sun and sea air would make Isabella better. It was there Isabella first attempted suicide. Next, he took Isabella to Ireland to visit her mother and sister. It was a trip that became a living hell for Thackeray. The family took a steamship from London to Cork, a journey of three days and four nights, during which time Isabella constantly tried to take her own life. She was nearly successful on the second day of the trip when she threw herself out the window of a water-closet. The crew found her in the water twenty minutes later held afloat by the air in her petticoats. After the disastrous sea voyage, an exhausted Thackeray started tying a ribbon around Isabella's waist at night, which he then attached to his own waist while he slept so he'd know if she tried to get out of bed. After an agonizing few weeks in Ireland with his unsupportive mother-in-law who firmly asserted her daughter was no longer her problem, Isabella’s condition was, not surprisingly, unimproved. So, Thackeray packed his family up and took them to his mother and step-father’s home in Paris. Thackeray had a close relationship with his mother and knew he could count on her to help him raise his daughters and take care of Isabella. Upon returning to France, Isabella was placed in Esquirol's Maison de Sante, a private asylum outside Paris. From that point on, she lived in several different French asylums throughout her life. Thackeray searched high and low for a cure for Isabella even undergoing hydrosudopathy with her, a treatment that was administered several times a day and involved sweating in blankets followed by a dowsing in ice cold water. Eventually, he brought her back to England where he paid two women, a mother and daughter, Mrs. Bakewell and Mrs. Gloyne, to care for her in their home in Camberwell. Until the end of his life, Thackeray took great joy in his daughters, Annie and Minnie, and despite the tragic turn his marriage took, it seems he never regretted it. Ann Monsarrat writes that he once told a young diplomat,"'Though my marriage was a wreck, as you know, I would do it once again, for behold, Love is the crown and completion of all earthly good.'" Lifelong bookworm. Lover of ghost stories and folklore who writes spooky fiction in her spare time. Is sometimes found rambling around old graveyards.